Canvas allows you to hide student names in Assignments, or in the Gradebook. By default, student names are shown in the Gradebook. However, you can hide student names in the Gradebook to remove bias in grading. You can hide student names in SpeedGrader for anonymous grading at the course level, and at the assignments level. Hiding student names in the Gradebook. Enabling blind grading at the assignment level. Enabling blind grading at the course level. From your Course Navigation, click Grades , click the Settings icon , and choose to Hide Student Names . You can undo this action, by clicking Grades in your Course Navigation , choose the Settings icon , and select Show Student Names . Open SpeedGrader from the assignment you would like to grade anonymously . Click the Settings icon near the top left of the browser . 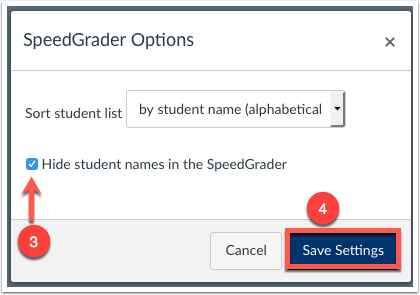 From the pop up, check the box to Hide student names in the SpeedGrader , and click Save Settings . You can check to see that the student names are hidden by clicking the student drop down menu. You will see the names of students are now listed as Student 1, Student 2, etc. 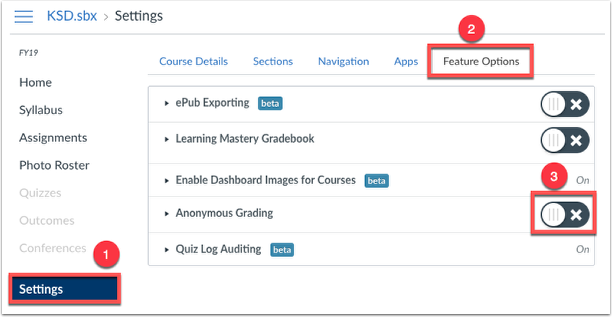 From your Course Navigation, click Settings , and select the tab Feature Options , and turn on Anonymous Grading . Turning this option on forces student names to be hidden in SpeedGrader. More information about blind grading can be found on the Poorvu Center for Teaching and Learning's website.